A fascinating read on someone who although I have heard so much about, to my shame I know very little. It is always inspiring and challenging to read how one life can have such an influence on a generation. Schaeffer's life and influence continues through the L'Abri communities that are still so popular and his writings. I have appreciated understanding more about the man and the formation of these communities. Although I would have appreciated a bit more in-depth analysis on certain aspects of his thought and writings I have been challenged to read more of what he has written personally. I think Duriez has published a very helpful and accessible biography. The Word of God in the Bible needs to be more than a set of intellectual truths that are assented to as if they only needed to be recited when asked. This is something that Francis Shaeffer wrestled with to a great degree. In my own life I have experienced a pull to defend Christianity for the wrong reason: to defend myself above all else. There is a sense that it is the party line that I have to tow. I have committed to being a member of the party and now if my belief system is challenged, I am challenged. My focus gets all out of sorts. Instead taking refuge in Christ and trusting in Him, I put the burden on my shoulders of being all that I can count on. I think that I have to be able to explain everything. I have to have all the answers. I have to be the winner. One of Francis’ daughters (Deborah) remarked how as Francis was returning to questions that he had asked when he first came to Christianity that were very specific. Questions like: “Is the Bible true?” Francis saw the broad practice of Christianity as one where there was much evidence that people who called them selves Christian didn’t show real evidence that they actually believed in Christ. This is an observation that every follower in Christ must come to deal with. It is an observation that I am still dealing with. I, and every Christian, needs to be able to remember what they believe and why they believe it. As a parent, the account of how Francis dealt with his daughter was particularly encouraging. She told him that she wasn’t a Christian and instead of just telling her not to worry and that she will feel better later, he actually stopped and let her ask whatever questions she wanted to ask about the faith. As it turned out, he treated any genuine enquirer the same way. Real questions were really considered and given real answers. This is the kind of thing you can do if you have real confidence that what you believe is true. You don’t have to avoid tough questions. At my worst, I avoid dealing with certain questions dealing with faith because I know that I am ignorant of what God really has to say about some things. One of the greatest encouragements a Christian can take from Francis’ story is regarding prayer. He prayed for everything. The ministry of L’Abri would not have been possible without the reliance on the Lord in the various aspects of running the mission there. Everything from financial support, who to minister to, who to recruit to do the work, and what to plan on for day to day operation were all brought before the Lord in prayer in reliance that He would be the one to bless each of these areas. Immediately after reading this as well as the reports of how Francis and Edith prayed for specific things that God provided for exactly and even in abundance, I was convicted of the lack of reliance on prayer in my own life. Their example is a guide for putting your faith in a God who is actually there and you really do expect Him to hear your prayers. I had just enough time to read this book during a short visit to L'Abri Fellowship in Rochester, Minnesota. It was an appropriate venue, because Francis and Edith Schaeffer founded L'Abri in Rochester, along with the "mother ship" in Switzerland.But I wish it had been longer. Francis Schaeffer was such a complex, fascinating figure, and at times the book seemed to move too swiftly.Still, no one better qualified than Colin Duriez is likely to come along to tell Schaeffer's story. He studied under Schaeffer at L'Abri in Switzerland and extensively interviewed him in 1980, four years before Schaeffer's death. His material includes interviews with any of the people who knew Schaeffer best, including his children.J.R.R. Tolkien once said of C.S. Lewis, "You'll never get to the bottom of him." ("Jack," by George Sayer)I think this also could be said of Francis Schaeffer. As a young man, he was the typical fundamentalist preacher, down to the super-short haircut and conservative clothes. After a spiritual crisis and spiritual renewal in the early 1950s, his fundamental beliefs never changed, but he became something completely different. He wore knee breeches and colorful socks, what remained of his hair long in the back with a goatee in front. He hung out late at night with rowdy Italians in Milan, banging a Coca-Cola bottle on the table as they banged wine bottles on the table.He quoted Bob Dylan and the Beatles. In 1968, in Berkeley, he went to a Jefferson Airplanes concert with 16-year-old son Franky and went on to purchase several of their albums and sometimes play them at full volume.He loved nothing better than to sit up long into the night, talking with university students.Duriez borrows this snippet from author Greg Jesson:"When Schaeffer lectured at Wheaton College and frequently referred to the existentialist films of Ingmar Bergman and Federico Fellini, the students were in the midst of fighting with the administration for the right to show films like 'Bambi' and 'Herbie the Love Bug' on campus. "(In Rochester L'Abri, at least, Tuesday evening is still movie-and-discussion night. )When Francis and Edith founded L'Abri -- French for "The Shelter" -- they did it with no fundraising and no plan. All were welcome; you didn't have to be a Christian to come. No topics of conversation were forbidden.Schaeffer provided the intellectual underpinnings for the Moral Majority and later the Christian Right without ever seeming to fit the popular image of the Moral Majority.He never strayed from the central mission of his life, described by Schaeffer in his 1980 interview with the author:"I'm only interested in an apologetic that leads in two directions, and the one is to lead people to Christ, as Savior, and the other is that after they are Christians, for them to realize the lordship of Christ in the whole of life." Francis Schaeffer is one of my favorite authors and a towering intellect in Christian history. Duriez' treatment of his phenomenal life story was a breath of fresh air. Schaeffer was accomplished as a faithful pastor and denominational influencer before his journey to Europe which resulted in the founding of L'Abri. In later life as a writer, philosopher, teacher, and lecturer (not mention a pioneer in the use of technology for the advancement of the gospel) Schaeffer impacted not only his generation, but many to come. Perhaps the most impactful aspect of the universality of Schaeffer's influence, is the fact that he didn't reach for any of it. Always reluctant to focus on anything but what (and who) was right in front of him, he impacted the world by bringing the gospel to all those who crossed his path. Francis and Edith Schaeffer maintain a powerful influence on the Evangelical world, as well they should. I greatly enjoyed reading Francis Schaeffer an Authentic Life by Colin Duriez. The book has a nice flow especially in the early chapters recounting the life of Dr. Schaeffer in his youth, meeting the love of his life, his education marriage, family, pastoral ministry and L'Abri. Colin also does a very nice job describing the trials that Francis faced in the fundamentalist movement and how in the end he retained the core of sound doctrine, yet with a different perspective of how that doctrine is to flesh out in the culture in which we live.In the later chapters there seems to be some redundancy of content, yet with that in mind I highly recommend this biography. This book is an easy read and flows well. Duriez is a good writer.One aspect of Schaeffer's early life with which I was unaware was the extent of his separatism, and his involvement with the International Council of Christian Churches, then his eventual move away from this position. Nor was I aware of his involvement with the Children for Christ movement. This is the biography of an highly intelligent complex man which the Christian world, during his lifetime or since, has fully appreciated. "For me, apologetics only has value insofar as it is related to evangelism". This quote from Schaeffer reflects the pastor-theologian's heart that Duriez adeptly captures in his biography. While other biographers have struggled with how to portray the passionate, oftentimes disagreeable man, this particular biography lays out the life of Shaeffer in light of his life-long and genuine wrestling with God, reality and Scripture, leading him to convictions that God would use to shape the evangelical landscape of today. Excellent read. Just started, but Colin is excellent in bringing you into Schaeffer's life by using great narrative...Now that I've finished Schaeffer's biography I have a renewed appreciation for the man and his ministry. He was an '80's spiritual hero of sorts to me. This book paints the fascinating and humble life of Fran...as he was called. Both his successes and struggles are pretty well documented. It has caused me to go back and reread some of his classic works as well as a few I didn't read. Highly recommend this book! Colin does a great job of providing a biography with personality. 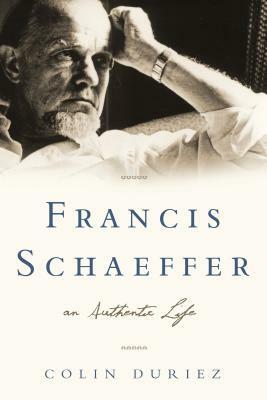 Biography of Francis Schaeffer who shaped theological thinking in the 60s though 80s. Very interesting life. He was a philosophical thinker who was concerned in the shift in Western thinking that took place during these decades. I am inspired to read his three core books, "Escape from Reason," "The God Who is There" aned "He is There and He is Not Silent," as well as his follow up book "True Spirituality." An upclose and personal look at a man who's been influential in shaping Christian thought, even after an early death in 1984. He left a legacy of many books that deal intellectually with Christianity (the one I've read is "True Spirituality") and the "L'Abri" centers throughout the world that welcome those seeking to engage in their faith journeys. The beginning of this biography was more interesting than toward the end ... I began to lose interest. This was an interesting and fairly easy to read (after the first two chapters) biography of a man I knew little about except for the names of some of his books. Rather than being a book I'll remember, the biography has spurred me on to go and read Schaeffer's own works for myself, which is I'm sure a result Duriez aimed for. This is an excellent book. To those who love and appreciate the work of Schaeffer, clearly one of the most significant Theologians and thinkers of the 20th century, or those who love the Gospel and the Truth; I would recommend this book. This is an excellent starter point in getting to know the man, his ministry, and his thought. Then go read his works! A fairly well written but general introduction to the man and his basic theology. Nothing is developed at length and so one leaves the book a little cold and feeling as though he should have been more properly presented to the man. As a travelogue it works fine; as a biography I much rather enjoyed the new Bonhoeffer book. Written from someone who knew him, offers insights on Schaeffer's life: what motivated him and kept him going. His commitment to evangelism, dedication to prayer, faithfulness to God's Word, ability to challenge the culture with clear thinking and his ability to articulate the faith impressed me from Schaeffer. He was a "prophet" for our times. I'd heard a lot about Francis Schaeffer through other books I've read and so I got this book because I wanted to learn more about him. The book is pretty detailed and at times it gets pretty boring. Did help me to understand more about him and the reasons he thought the way he thought. Bit disappointed in this book. Dry in places and I personally am of the opinion that it really only scratched the surface of the life of fs. An inspirational and challenging life. Someone who mixed intellectual honesty with genuine care and concern for others. A detailed accounting of Schaeffer's life and work which includes strengths and weaknesses but generally is a grateful and positive portrayal. I liked it. An interesting biography of someone I didn't know much about. I'm not a big biography fan, but it was good as biographies go. A fascinating subject, but the book didn't really grab my interest like I thought it might. Does make me want to read more of Schaeffer's books though. Great life of a great man. Makes me want to read some more Schaeffer now. Colin Duriez - Colin Duriez is a writer on fantasy and related matters.He was born in Derbyshire and spent his early life in Long Eaton, Derbyshire , in a couple of new council estates near Portsmouth and six years in a mining village in South Wales, before moving to the West Midlands. After school he studied for two years at the University of Istanbul, Turkey, before completing his studies at the University of Ulster in Coleraine, Northern Ireland where he read English and philosophy. After a career in editing and journalism in London, interspersed with some teaching, he migrated to Leicester in 1983 to work with a small publisher, IVP, as a commissioning editor. In 2002 he started his own business, InWriting, devoted to writing, editorial services, and some book acquisition for publishers.Duriez won the Clyde S. Kilby Award in 1994 for his research on the Inklings. He has published many articles, books and other written works, and he has spoken to a variety of literary, academic and professional groups. His best-known books include The C. S. Lewis Handbook (Monarch Publications/Baker Book House, 1990), the Tolkien and Middle-earth Handbook (Monarch Publications/Baker Book House/Angus & Robertson, 1992), The C. S. Lewis Encyclopedia (Crossway, 2000/SPCK, 2002), The Inklings Handbook (co-authored with David Porter, Azure/Chalice Books, 2001) and Tolkien and The Lord of the Rings (Azure/Hidden Spring, 2001).